In our previous blog, we shared a thorough review of the timeline your kitchen renovation will likely adhere to and where backsplash tile fit into that. Today, we’ll share with you similar information about your floor tile, although there is a bit more wiggle room when it comes to your flooring. When you’re opting for a tile in your kitchen, you’re choosing a type of flooring that could very well last as long as the countertops, cabinets, and other major fixtures you’re adding in. There are, however, certain things your flooring should, ideally, come before or after, accordingly; today, we’ll share how to navigate this often confusing timeline. In general, no flooring should be installed while your home is still undergoing construction of any sort. Now, this means that you should no longer see sheets of drywall, texture guns, support beams, or other major, structural elements. In fact, all of the basic electrical, HVAC or mechanical, structural, and other “rough-in” permit elements should already be done and dry before you even open your kitchen floor tiles. As a general rule of thumb, your inspector shouldn’t walk on your kitchen tiles until you’ve reached the “final inspection” stage, though exceptions do apply in especially complicated projects. This should be a no-brainer, but it’s worth saying: If at all possible, do not install your kitchen’s floor tiles before you paint the room. In fact, painting should be done as soon as your drywall finishing is done, above the subfloor or slab, and long before any cabinets or flooring is brought into the space. If you swap these two, you aren’t necessarily going to hard to harm your floor – homes are painted with flooring long installed all the time, after all – but why take the risk? Remember: Every drop cloth and bit of excess foot traffic will leave you with more cleaning to do at the end of your renovation, notwithstanding any paint splatters that make their way onto your tile. Ah, here is an interesting difference between floor tiles and other types of flooring. When you install stone tiles as your kitchen flooring, you are able to enjoy much more time with your kitchen’s floor than the average type of flooring material, which may seem inconsequential, until you realize that cabinets can be installed before or after flooring. If you’ve thought it through, you’ll realize that your flooring could outlast your cabinets, meaning that you’ll definitely want the floor tiles be installed before the cabinets, just in case you ever want to expose that space. If you installed a basic hardwood or vinyl, this would be much less likely to occur, leaving you more likely to opt for a no-floor installation. When it comes to tile, it is always best to sneak some under the cabinets – just in case. If you’re trying to be economical about your flooring installation, then you likely want all of it go down all at once. For consecutive spaces, this only makes sense, but what if you are also installing the same tile in a bathroom, basement, patio, or other area of your home? Likewise, you may even consider using excess tile to finish a fire pit or surround your fireplace, but when do you schedule this work? Ideally, you should trust your instincts and do both installations at once, whenever possible. If this means that your bathroom has to go a couple of weeks longer on subfloor than you’d like, it’s still better to wait, as you’ll likely save a good deal on your installation costs. 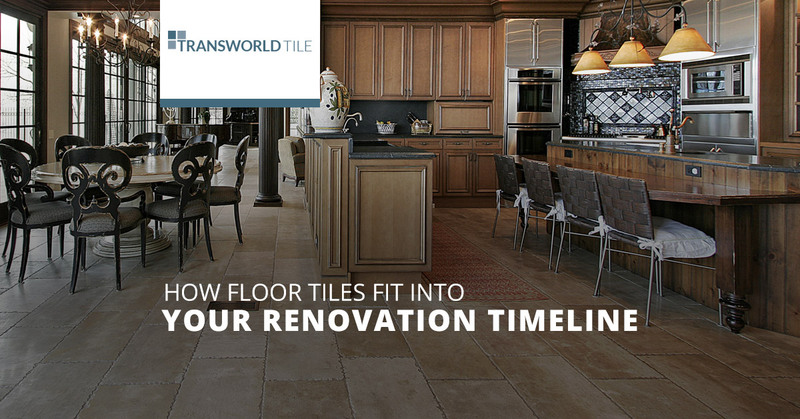 Whenever you’re considering a renovation project in your home, visit Transworld Tile for the best selection of kitchen and bathroom tiles. Our diverse selection can suit just about every area of your home, inside and out, and our experienced staff is widely considered the most honest and knowledgeable in the Thousand Oaks area. Whether you’re ready for inspiration on an upcoming project or supplies to complete your home, visit our store for the best local service you can find! Learn more about our kitchen tiles here!